While it's widely know that penrose triangles are "impossible objects", when they're in shirt form they actually fare alright. While this shirt was originally a product of Heavy Rotation, it's now out of stock. 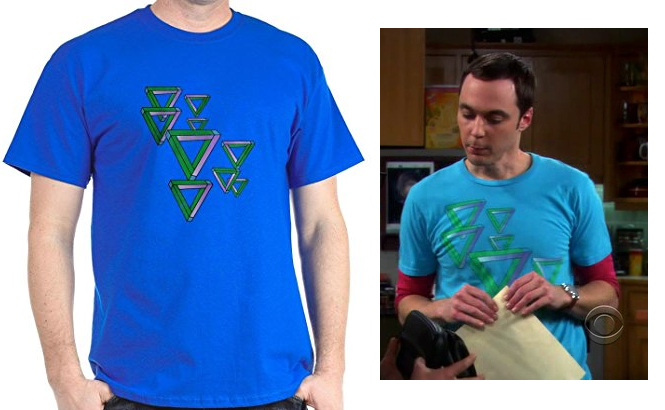 For one close to Sheldon's in appearance, however, try visiting this link at TVStoreOnline.com. S02 E06: "The Cooper-Nowitzki Theorem"
S04 E03: "The Zazzy Substitution"
S04 E11: "The Justice League Recombination"
S04 E15: "The Benefactor Factor"
S04 E18: "The Prestidigitation Approximation"
S07 E05: "The Workplace Proximity"
S12 E14: "The Meteorite Manifestation"